Written sketch of downtown L.A. with two L.A.music men. Both guys… I respect. One I’ve know for twenty-five years; the other I have known six. Both have roots deep in the underground music scene of Los Angeles; one a fanzine journalist and the other from a band while also currently promoting bands. 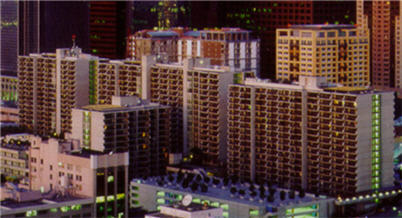 At night the buildings of light merged along the Hollywood freeway. The fast-moving river of car lights of red and white screamed a colorful expression to the low foggy clouds above. Clubs, restaurants, movies and driving home from work; happy-hour peaked in the city! Cars stopping too quickly and others were slicing in front to get by as the strong current of cars raced towards the Broadway exit. The lost shadow of Bunker Hill and Angel’s Flight whispered a Déjà of voices among the unknown new buildings standing tall near and around the Angelus Plaza. Parking was good past 8 PM and walking on Hill St. with my old black boots gravitated with familiar strides of a dark night. This October night was quiet, off and a bit tilted. Noir, unfamiliar and vexed I felt a blend between the femme fatale and the innocent unaware woman. On Hill between 4th and 3rd the bar seemed silent and as we walked in past the bouncer; the bar echoed Mexican-American music. Going towards the back of course the music pulled us in and soon both of us were greeted by the birthday boy. He put out his own fanzine promoting the scene he loved; The other was going to tour Australia which was his dream come true. While drinking beers, gazing above at the three giant buildings dancing lazily in the foggy clouds, I felt secure in the iron fence outdoor patio. Our birthday friend recommended the classico margarita. I’m sure that this place, this bar and this drink are known by many. It was a tasty drink and it lingered on my taste buds as we said our goodbye and walked to the next bar on 2nd Street. Funny now older… how I feel time bends. What seems so long ago; what I wanted to run from then, now bends and reaches back towards me. Seeming closer now than then. Both guys were a couple blocks from each other last night; they both hold and continue to endure that something that binds us to the underground music scene of Los Angeles. He was standing at the entrance to the bar. Our friend quickly stamped our wrists before we knew it. We did not plan to go there. We talked and when inside the club my appetite was soon satisfied with one of the best club-hamburgers around. Sweet ranch dressing, french fries and beer; loud live music, smoky leather jackets and the cocktail waitress all moved tilted and noir before my sleepy eyes. This entry was posted in "In the beginning there was a void except for the written word." The Avengers (Band) and tagged Alternative music, Downtown Los Angeles, Los Angeles, Los Angeles Clubs, movie palaces, postaday, Subculture, The Broadway Theater District, underground music scene. Bookmark the permalink.